Weather continues to be the focus as we progress into the growing season. A non-threatening two week forecast for the midwest indicating cooler and wetter conditions for the region has limited new buying interest. There is still a lot of concern with the dryness in the central/northern plains. This has given substantial strength to wheat prices due to their collapsing conditions ratings. This has provided some support to the corn market recently. But, please keep in mind, if/when the thoughts change, to where some of the wheat becomes “feed grade” instead of “food grade”, this will work against corn. The USDA’s most recent corn production number for Brazil sits at 97 MMT for this year, an increase of 45% from the previous season. 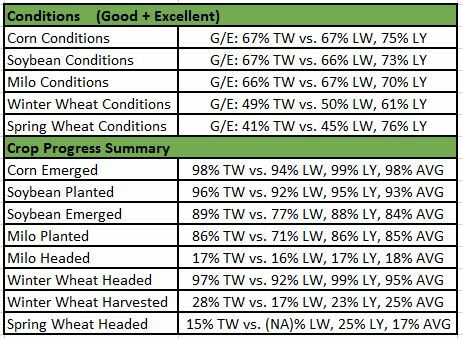 Yesterday’s national crop progress report results showed unchanged G/E ratings for corn, and a 1% improvement for beans. Iowa corn crop standing by itself was rated 78% vs. 77% last week, while 74% of Iowa’s soybeans were rated good/excellent vs. 73% last week. Next Monday, June 26th, Landus Cooperative will be hosting a Brock seminar in Jefferson. If you would like to attend, contact your local Grain Marketing Advisor, or use the website www.summerdecisions.com. Just click on the link for Jefferson, IA, and then use the promo code of “Landus-IA” to receive a complimentary registration. Personally, I am looking forward to hearing Al Dutcher, Nebraska State Climatologist. I have heard Al before, and I think he brings a down to earth perspective to his presentations. We hope to see you there. You can always call the Ames office at 877-778-2226 for help with registering. Have a great day and thank you for your business!